Having a restraining order against you can not only be a huge inconvenience to the logistics of your life, but it can also be harmful to your reputation and, in some cases, may be unfair and unjust. Restraining orders are issued by courts in New Jersey to protect victims of domestic violence. There are two different types of restraining orders: temporary restraining orders (TRO) and final restraining orders (FRO). FROs are issued after a full hearing where the accused has an opportunity to defend themselves. Once an FRO is issued by court, it is permanent and can only be vacated by a judge’s order. Having such a long-lasting impact, many individuals who are subject to restraining orders want to how to get a restraining order lifted in New Jersey. The experienced attorneys at our Camden County defense law firm have helped a multitude of clients remove final restraining orders in Burlington County, Camden County, and throughout New Jersey. To find out how our restraining order lawyers can help you get rid of an FRO, contact our office today at 609-832-3202. You can also send us a message to arrange a free consultation about your case. How do I Get a Restraining Order Removed in NJ? You may have had a restraining order issued against you years ago and, since that time, you have resolved all of the underlying problems that formed the basis of the need for a restraining order and the plaintiff in your case might also want the restraining order to be lifted. While FROs are permanent, we know that people change and problems heal. Perhaps so much time has passed that the restraining order is simply not necessary, as you and the plaintiff have no contact anyway. The ability to file a motion to vacate a restraining order gives you the opportunity to show the court that there is good cause to lift the order. 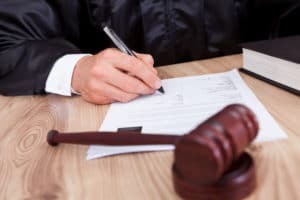 To get a restraining order vacated in New Jersey, you must first file a motion to vacate the restraining order and make a showing of good cause for lifting the order to the court. In reviewing your motion to vacate, the court will consider various factors set forth in Carfagno v. Carfagno, 288 N.J. Super. 424 (Ch. Div. 1995). These factors include consent from the plaintiff to lift the order, if the defendant fears the plaintiff, good faith of the plaintiff, the current relationship between the plaintiff and the defendant, the defendant’s alcohol and drug treatment and domestic violence counseling, the defendant’s contempt convictions for violating the restraining order, the defendant’s history of violence, age and health of the defendant, whether there are orders entered against the defendant in other jurisdictions, and any other factors the court finds relevant. Even if the court determines there is good cause to vacate a FRO, your name will remain on the National Domestic Violence Registry. A finding of domestic violence in a criminal case involving assault, harassment, terroristic threats, or another offense will also not be removed by an order vacating a restraining order and will remain part of your record. If you are seeking to vacate a restraining order in New Jersey, you should not attempt to navigate the complexity of this process alone. It is not easy to get a final restraining order lifted and you must understand the legal and procedural nuances of New Jersey restraining order laws in order to have your request approved by the court. The experienced NJ domestic violence lawyers at our firm have extensive experience in applying the factors in Carfagno and demonstrating good cause to the judge. To speak with an attorney who has successfully handled many restraining order removal cases before, call us today at 609-832-3202 for a review of your case. Consultations are always provided free of charge.